It seems that within the last few years the Reformed Baptist movement has taken a step or two backwards. Blogs that used to provide great content for Reformed (Particular) Baptists or websites that did the same, have disappeared over the last few years. The Confessing Baptist site is gone. One cannot click a link for it without getting an error message. Pb Ministries has disappeared. I could go on and on listing sites, but you all should get the picture just by the few I listed. It also seems that there is little to no interest for a library for Reformed (Particular) Baptists. Having spent upwards to 18 hours a day building the Vol I Library has done nothing to peak the interest among Reformed (Particular) Baptists. I have had a few suggestions that I should build a library that would be Baptist friendly and that would also be an alternative to the Puritan Hard Drive. In other words, several folks have told me that I should build a library that would require the selling of a hard drive for Reformed (Particular) Baptists. This was my goal. My goal was to build a library that was Baptist friendly and also a library that was so big that it would have to fit on a hard-drive. However, since releasing The Baptist Library Vol I. I have sold absolutely no copies. My posts have been shared on Facebook, Reddit, Tumbler, Youtube, Linkedin, and this blog. I have also had my post shared in several Facebook groups that are centered on Reformed Baptist Theology. With 350 Cd’s ready to ship, but no buyers of said Cd’s, I have stopped thinking about a library for Reformed (Particular) Baptists and have started concentrating on how I will pay my bills. So for the time being, all work has ceased and it looks like I will be going back out on the road driving a big rig. Now I don’t mind working and I love truck driving, however, I also love trying to build a library that will equip saints for the ministry of spreading the gospel. This is my number one goal in life and that is to develop something that will aide people in their study of the Bible and in making them more knowledgeable in sharing the gospel of Jesus Christ. So my heart is divided. I want more than anything to put that drive together, yet I also have to provide for my household. Seeing that a labourer or worker is worthy of his hire, no matter if he has a secular job, or if he is in the ministry of equipping the saints, then whatsoever he does ought to provide for his household. With that said, I have come across many a website that claims one should not make money or be paid for their work in the things of God. This is simply not true. Scripture is plain that a minster is worthy of his hire and that ministry ought to provide for the necessities of this life. Once I go back out on the road everything will continue on here at Reformedontheweb as usual. I have placed enough post in scheduled post mode, so that I don’t have to touch this blog for several months. However, as I have time, I will log into this site and answer questions, moderator comments, and pre-schedule some more post. The Baptist Library Vol I will still be available for purchase while I am gone. This includes all individual collections as well. My wife will ship out the orders while I am on the road. Thank you to all those who have followed this blog over the past 9 years. Several years ago when the Puritan hard Drive was in Cd format, I decided to purchase them. It took over 2 years and $895.00 to finally receive what is now called the Puritan Hard Drive. The owner and manufacturer of this drive is Still Water Revival Books owned and operated by Reg Barrow. Once the drive finally arrived I could not get it to work properly on my main computer and contacted SWRB and they hooked me up with their engineer. (I know, Right! Who hooks you to the engineer when you are having technical difficulties with a product) Through several emails we worked back and forth, but could not resolve the situation. Due to not being able to use the drive on my main computer, that and several other factors, I wrote a critique of this drive. SWRB has a whole page devoted to critiquing my critique, however, Reg Barrows resulted to slander and ad hominem, instead of debating the issues. I had been accused of contacting his affiliates through email and by phone and harassing them. So I wrote another critique in response to that. At the time I used At&t cellular service as my primary phone service. My At&t bill would arrive with a full statement showing every call that had been made from my phone during that month. I still have all these billing statements and no phone call can be found to anyone regarding this matter. I also kept my emails from John Hendryx. In the critique put up by SWRB, Reg Barrows claims that I harassed his affiliates through email and phone, yet the only testimony he has is the one by John Hendryx. John Hendryx supposedly said, “Seems mentally unstable or something insisting that the whole thing is my fault.” This statement does not trouble me. It just makes me wonder how anyone can run a Christian website and not have SWRB take that statement down while asking forgiveness of the one he is slandering, knowing that he was in agreement with me throughout this whole process. I don’t want to speculate, but advertising money will make individuals change positions on a whole lot of things. The Lord will judge those who slander others falsely. My first and second critique were made into Pdf’s back when I wrote them and a link to them is on the webpage above the list of books on the drive. So if you want to go through the list of names or download my critiques, then visit my page. The link below the ‘Puritan Hard Drive’ link entitled: ‘Sample Page,’ is to a pdf containing only one page. A lot of these Pdf’s are scanned copies of books and so I copied one page and put it in pdf, in order that you would know how hard it is to read some of these files. Theology matters. Place for Truth has no interest in smoothing over the rough edges of disagreements within the Reformed confessional tradition. But we also know that debates can often descend into name-calling and straw man arguments. Over two days, we are posting two brief summaries – one by a pastor of paedo-baptist persuasion, one by a Baptist pastor – on a subject that matters. We hope you’ll read both. They’ve each read the other’s article, and they’ve both presented their own arguments clearly and fairly. Both men argue – as you’ll see – from a theological perspective that reflects the framework of the Reformed confessions. Neither backs down. But the arguments they employ, and the spirit with which they employ them, are worthy of our time and attention. The practice of baptizing professing believers is grounded upon two complementary foundations. The first is an argument from the covenants of Scripture. The second is an argument from the commands of Scripture related to those covenants. Credobaptists and paedobaptists often assume, or argue, that the people of a given covenant receive the covenant sign. Thus, in the case of the subjects of baptism one must simply identify the covenant people. This is insufficient. The administration of covenantal ordinances is governed by specific laws, which must be obeyed strictly. For example, women were members of Abraham’s covenant but they were not recipients of its sign, circumcision. Likewise, infant males were circumcised, but only on the eighth day. As a result, to determine the subjects of baptism one must first identify and distinguish the covenants involved and then examine the accompanying laws. Since my book first came out in January of 2013, I wanted to revise it. At first it was minor corrections and typos, but along the way came some important precision that I wanted to include in my work. I have written this blog post to explain what’s new in the revised edition of the Distinctiveness. If you think it’s worth it, you may buy the paperback version or the kindle version (available beginning of next week Feb. 12th) on Amazon. Let’s start with a new endorsement by an important French theologian. The French-speaking Baptists, at least those from Europe (as I am), often ignore the Reformed origin from which the Baptist faith emerged—the genealogical continuity is certain. 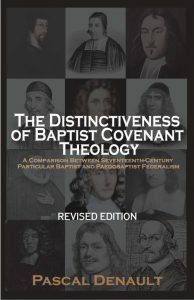 The fine work of this French Canadian pastor on the theology of the covenant, or the covenants, which was elaborated by the ancient Baptist doctors debating the other Reformed theologians, vividly presents this rooting. It also highlights….